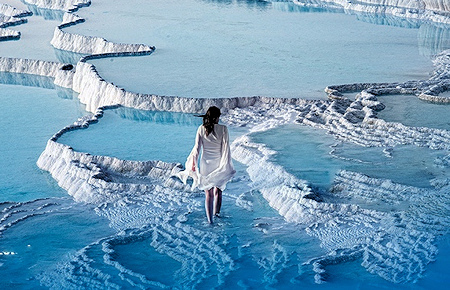 Meaning "cotton castle" in Turkish, Pamukkale is the 8th wonder of the world. This natural formation contains hot springs and travertine, terraces of carbonate minerals left by the flowing water. It can be seen from the hills on the opposite side of the valley in the town of Denizli, as far as 20 kilometers away. On top of this white "castle" which is approximately 2,700 meters long, 600 meters wide, and 160 meters high, the ancient city of Hierapolis was built. 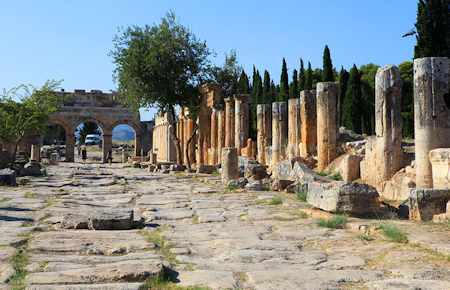 Here you will visit an ancient Roman amphitheater, the historical museum (former Turkish bath), the ancient Cleopatra swimming pool (optional), monumental tomb of St. Philippe, the magnificent Necropolis of Anatolia, and much more. 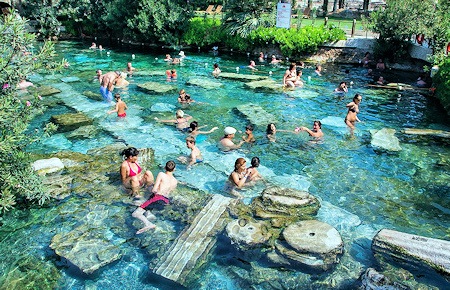 Because of the glorious white travertine and historical value of Hierapolis Ancient City Pamukkale was added to the UNESCO World Cultural Heritage in 1988. Antalya, Lara, Kundu, Konyaalti Antalya. Belek, Kemer, Beldibi areas available at additional pick up and drop back fees.